Following on from my post that walks through the set up of an Ubuntu based IPSec VPN server using Openswan and Android, I've now had the chance to also configure an iOS device to work with the same configuration. 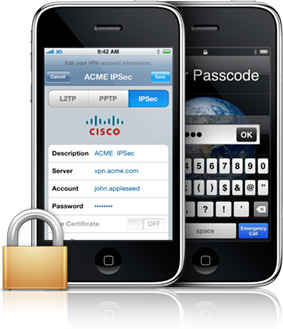 Read on to see how I configured the iOS 5.0 iPhone 3GS to work with my Openswan IPSec VPN...The following steps I used on an iPhone 3GS iOS 5.o to connect to an Ubuntu IPSec VPN configuration. I love the relevant info show forth in your posts. Thank you for the information you shared with us. If you face any kind of problem in RocketMail you can contact to the RocketMail password recovery team and here our best technicians will provide you the best guidance within a few minutes. RocketMail Password Reset team provide 24*7 so the user can contact the Rocketmail Password Recovery team anytime. If you face any sort of issue in Windows, you can contact the Windows password recovery team and here our best professionals will give you the best direction inside a couple of minutes. Windows Password recovery gives 24*7 so the user can contact the Windows Password Recovery" team whenever. If you face any kind of problem in PDF you can contact the PDF password recovery team and here our best technicians will provide you the best guidance within a few minutes. PDF Password Reset team provides 24*7 so the user can contact the PDF Password Recovery team anytime.